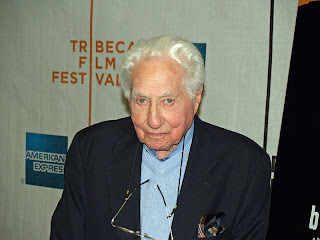 Goodbye to Budd Schulberg, the writer best known as the Oscar-winning screenwriter of On the Waterfront (1954). He was also a novelist, most famously of the notorious Hollywood tale See Sammy Run, and a journalist, primarily covering his favorite sport, boxing, which brought him an induction into the International Boxing Hall of Fame in 2003. He also co-founded the Watts Writers Workshop in the wake of the 1965 riots and won an Emmy for the resulting television special, The Angry Voices of Watts (1966). Schulberg grew up a pampered son of Hollywood. His father, B.P. Schulberg, was head of Paramount Pictures in the 1920s and early 30s and his mother Adeline was a literary agent. He described his childhood, and Hollywood as it moved into the age of talkies, in his vivid 1981 autobiography Moving Pictures: Memoirs of a Hollywood Prince. As a teenage publicist at Paramount, Schulberg fabricated biographies for contract players. He also started young as a screenwriter, starting with uncredited contributions to A Star is Born (1937). He would also write the script for the initially ignored, but now classic, A Face in the Crowd (1957). His other notable novels include The Harder They Fall (which was the basis for the 1956 Humphrey Bogart movie) and The Disenchanted. During World War II, he worked for John Ford’s documentary unit while he served in the navy. In 1951 Schulberg angered many in Hollywood when, after admitting to the House Un-American Activities Committee that he had once been a communist, he informed on several of his peers, causing their blacklisting. Though many assumed that his script for Waterfront was an apologia for his testimony, Schulberg always firmly denied any regret for his testimonial. Schulberg was working on projects to the end of his 95 years, including a follow up to his last memoir. He died of natural causes in Long Island and is survived by his wife and five children from three of his four marriages.